Sign-up and receive Property Email Alerts of Residential Estates in The Capital Mirage, De Waterkant. Choose to invest where cultural sophistication meets Cape Town's incomparable lifestyle. Silhouetted against the magnificent backdrop of Table Mountain, offering stunning views of the Cape Town skyline, The Capital Mirage is primely situated in De Waterkant, next to the V&A Waterfront. These luxurious apartments are at the heart of Cape Town's vibrant cultural resurgence. In the busy hub of couture and cuisine, where decor, art and fashion intersect with the world's most tasteful dining experiences. Where streets are lined with restaurants, art galleries, design boutiques, tapas bars and sidewalk cafes. Offering property investors the opportunity to buy apartments within the hotel, with a guaranteed rental income from your investment for three years, with an option to extend for up to nine years. The Capital Hotel becomes the direct tenant of each unit and The Capital then gives owners a guaranteed monthly rental. The Capital guarantees a 6% annual escalation. There are also no maintenance issues with an on-site maintenance team handling the upkeep of your unit on your behalf. The Capital Mirage is unique in that it is the only property investment opportunity that makes such guarantees. Buyers who sign a lease with The Capital Hotel are also entitled to a 25% discount off the standard rates at all of The Capital Hotels nationwide including The Capital Mirage. 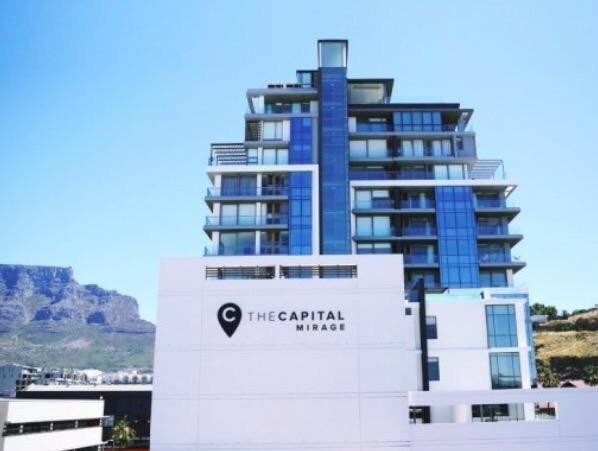 Prices at The Capital Mirage start at R2 890 000 for a studio apartment and this provides a rental return of R18 500 p/m, subject to the purchase of a furniture package for R150 000. Superior units sell for R3 790 000 and offer a rental return of R24 000 per month (subject to the purchase of a furniture package for R180 000), whilst 2 Bed apartments sell from R6 690 000 and offer a rental return of R37 000 per month, with a furniture package for R320 000. The Capital Mirage has been constructed using a contemporary blend of natural stone and timber finishes and boasts a wide range of facilities that include The Vue Sky Bar and restaurant, a rooftop swimming pool, a spa and hair salon, a gin and snooker lounge, a Cattle Baron, a concierge service, CCTV with 24-hour security, a full backup generator, a gym and more. Benefits of buying at The Capital Mirage include, Opportunity to own a premium property investment in one of the most desirable and affluent areas of Cape Town, Guaranteed monthly rental income for three years, with an option to extend for up to nine years - even if there is no occupancy, No maintenance issues, with an on-site maintenance team handling the ongoing upkeep of your unit, Apartment serviced and maintained according to the quality standards afforded by a national 4 star hotel group and Owners receive a 25% discount off the standard rates when booking at any of the Capital Hotels nationwide, including the Capital Mirage. 62 state of the art, contemporary studios and two bedroomed apartments features include, Fully furnished to the highest international standards, Integrated air-conditioning, Underfloor heating, Full kitchen with washing machine, tumble dryer, fridge, stove, oven, extractor fan, microwave, Nespresso pod machine, Open plan lounge, Duravit baths and toilets, Carpets to bedrooms and tiles to kitchen and bathrooms, King or single beds extra length, HD 55 inch LED television, DVD player and Superior apartments and 2 bedroom apartments have a balcony.